No one likes a copycat, especially when it comes to car design. Car companies are often accused of having derivative styling, but what happens when one company literally copies another? 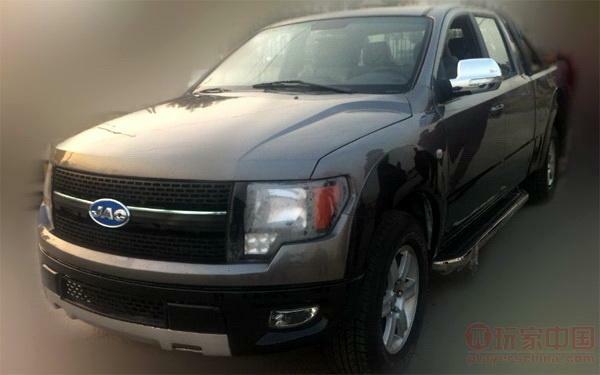 The JAC 4R3 looks a lot like a Ford F-150, which is why Ford blocked the Chinese company from selling it. In the past, foreign companies filing claims of copyright infringement in China were usually defeated by the government, which sided with domestic carmakers. The Chinese government also requires foreign carmakers to partner with domestic companies, which does force companies like Ford to divulge information they normally would not. However, JAC is not one of Ford’s Chinese partners, so the Blue Oval had solid legal justification. Given the Chinese government’s past behavior, it is likely that Ford had a little help. The government may have sided with Ford this time. It remains to be seen whether JAC will respect the decision, or build its knock off F-150 anyway. The 4R3 is an eerie facsimile of Ford’s popular truck. It looks like the unlicensed toy cars sold in pharmacies; there are no Ford badges, but it is obvious what vehicle this is supposed to be. Even the JAC badge is a copy: it’s a blue oval. However, underneath the skin, the 4R3 has little in company with the F-150. The Chinese truck is powered by a pathetic 2.8-liter diesel that only makes 108 horsepower and 177 pound-feet of torque. That’s nothing compared to the real F-150’s range of V6 and V8 engines, or even a 1.8-liter Toyota Corolla, which has 132 hp. Ford is not the first foreign carmaker to have its designs copied in Chinas. In 2006, Shijiazhuang Shuanghuan came out with an SUV called the SCEO that aped the BMW X5. BMW sued in China, and lost, but the SCEO was ruled a fraud by the German government. Shuanghuan also made a Smart Fortwo knock off called the Noble. Smart’s micro car rival, the Mini Cooper, was also run through the photocopier, creating the Lifan 320. Designs from Mercedes, Scion, and Chevy were also reproduced by Chinese companies. The Chinese copies are usually cheaper (a 2006 X5 cost about $50,000; an SCEO was $19,000), but not as well made. Hopefully Ford’s victory will force these Chinese carmakers to come up with their own ideas.